Neo launched in Spring 2018 and it continues to dominate in 2019. The fully loaded ergonomic chair with its sleek design and built-in lumbar support is unique. Seek shelter from the norm. Every building has those spaces that people are drawn to for escape. Some are intentional through architecture, while others are more natural and based on flow and activity or the lack of it. Nooks, alcoves, corridors, and stairs often present an escape and that’s exactly what LeanTo is designed to achieve. Keep calm with coordinated color. 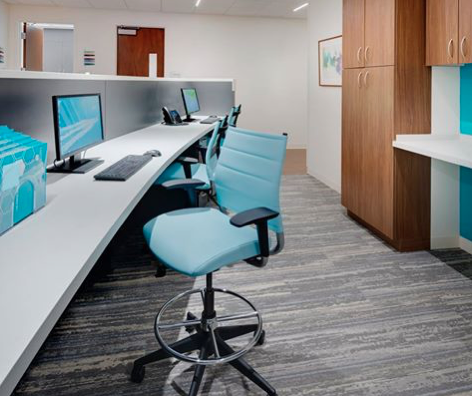 This medical office pairs the aqua mesh Wit stool with office stationary, wall paint and more for a soothing environment. Rigorous, credible workplace research is good for our industry and for leaders because it helps inform decisions. In this article, the author has done the research on this highly debated topic! Mimeo's ergonomically designed structure flexes as you adjust your position. Click through to see Mimeo in showrooms and learn more about the ergonomic task chair. it sounds ho-hum, but it’s vital within today’s incredibly shrinking office footprint. HON storage keeps your stuff out of sight, on display or on the ready. 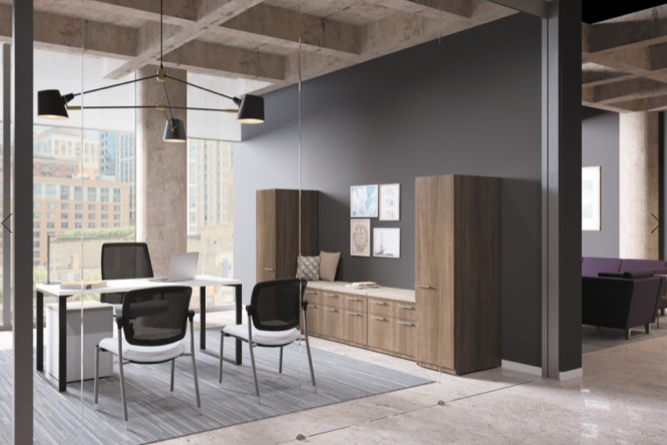 Work Design publisher, Bob Fox has again spent the month of January picking the brains of industry experts, clients, and peers while reviewing patterns in the market to round up his predictions for the biggest workplace trends in 2019. 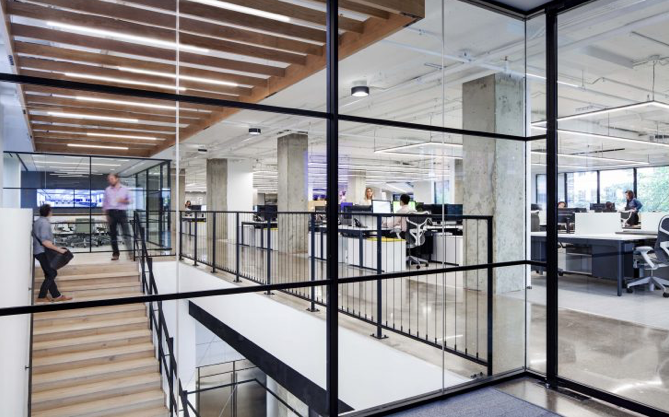 His list of five major trends include some new and some continuations that he expects will make an impact on the workplace this year. Searching for a clean-and-pristine, cozy corner for that midday break? 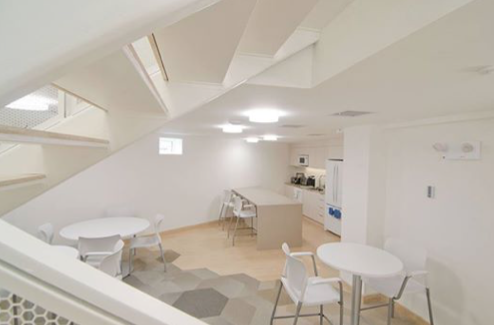 Then, see how InFlex by @SitOnItSeating delivers on looks and feel at this office hideaway. Welcoming someone requires an emotional connection. A place that really makes people feel welcome does more than just offer a comfortable seat or a calm feeling—it helps people feel like they belong. The Liberty Task chair is an intelligent mesh task chair engineered to provide automatic lumbar support for every user, as well offering simplicity and complete ease of use. And that's not all! In the age of open-plan offices, some workplaces are building in separate spaces in which to focus or regroup. In Japanese, Heya means “small room.” @OFS Brands Designer Roger Webb created Heya to form smaller spaces within an environment. Designed for both individuals and groups in mind, Heya’s comfort and visual softness allow these small rooms to blend seamlessly into the office, while still providing the closeness and privacy people need to really focus. Webb took Heya to a more portable level with Heya mobile, creating the option to adjust the space according to employee needs throughout the day. High performance meets sustainability with SitOnIt Seating's Sili-Tex. Sili-Tex is the manufacturer's answer to growing demand for a premium, performance-driven coated fabric at an affordable price. When it passes the “Fun Test”, it’s sure to be a winner. From schools to cafes to office open spaces – where would you like to sit in Rock? Start the new week with Novo®. Built-in lumbar support and optional height-adjustable arms allow you to settle in, get comfy and gather your thoughts in time to manage the Monday mania. Taking the desk tray into the 21st century: from cables to chargers, today’s workers need more than an open drawer to keep tools and tech in place. 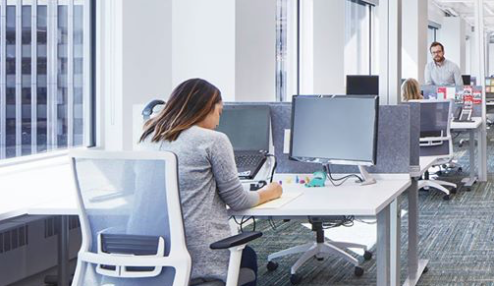 Environments that combine comfort, function and emotional satisfaction can inspire people to do their best work as well as increase productivity, satisfaction and engagement. Based on their research, Coalesse offers these tips for bringing wellbeing into the workplace.